Haystack Rock is a gigantic 235-foot sea stack. The curious look of both Haystack Rock, and the other surrounding rocky spires, make it a popular tourist spot. The rock is also a popular spot for animals, with terns and puffins using it as a nesting spot. In the tide pools around the rock, starfish, crabs, sea slugs, sea anemones, and other such creatures can be found. Haystack Rock is made of basalt, formed by lava flows from the Grand Ronde Mountains. Cannon Beach, where the rock is located, is a very gradual beach, with the water level very slowly deepening. This lends itself to creating a beautiful, serene atmosphere. 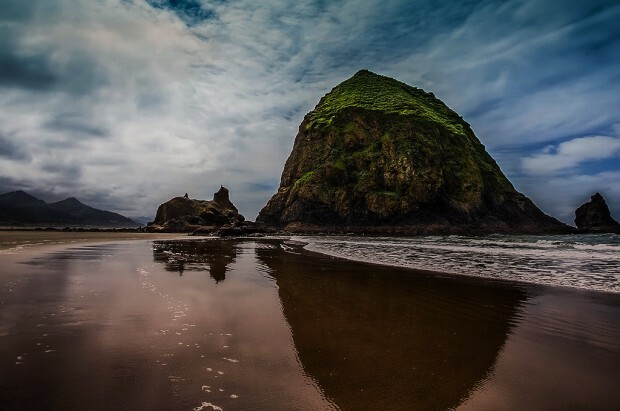 Cannon Beach and Haystack Rock, can be found off of Highway 101, in Clatsop County.